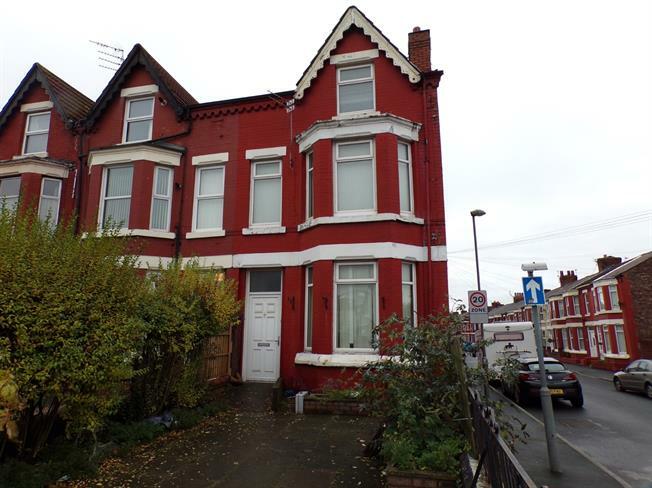 6 Bedroom End of Terrace House For Sale in Liverpool for Asking Price £149,950. Entwistle Green Walton Vale are now in receipt of an offer for the sum of 124,995 for 71 Orrell Lane, Orrell Park, Liverpool, L9 8BX. Anyone wishing to place an offer on the property should contact Entwistle Green, 51 Walton Vale, Liverpool, L9 4RF on 0151 525 9050 before exchange of contracts. Offered to the open sales market with no chain delay Entwistle Green are advertising this six bedroom end terraced house. The property briefly comprises to the ground floor, entrance vestibule, hallway, lounge, living room, dining room and kitchen. To the first floor there are four bedrooms, en suite shower room and family bathroom and to the second floor there are two further bedrooms with second en-suite shower room. To the outside there is rear yard and paved access to the front. The property further benefits from double glazed windows and gas central heating. Call our local high street branch today to gain more information or to book a viewing. UPVC front door and tiled flooring. Radiator, laminate flooring, painted plaster ceiling with ceiling light and stairs leading to first floor. Double glazed uPVC bay window to front aspect, radiator, gas fire with feature surround laminate flooring and painted plaster ceiling with ceiling light. Double glazed uPVC window to side aspect, radiator, gas fire with feature surround and painted plaster ceiling with ceiling light. Wooden back door leading to rear yard, two double glazed uPVC windows to rear aspect, tiled flooring, spotlights to ceiling, roll top work surface, wall and base units, stainless steel sink with mixer tap, electric oven and hob with overhead extractor and space for washing machine and fridge/freezer. Laminate flooring, stairs leading from ground floor plus stairway leading to second floor. Double glazed uPVC window with frosted glass to side aspect, heated towel rail, tiled flooring, tiled walls, spotlights to ceiling, low level WC, double shower cubicle with thermostatic shower and vanity unit with wash hand basin. Double glazed uPVC window to side aspect, laminate flooring and painted plaster ceiling with ceiling light. Double glazed uPVC window with frosted glass. Radiator, vinyl flooring, tiled walls, painted plaster ceiling, ceiling light. Low level WC, roll top bath, electric shower, pedestal sink. Double glazed wood velux window to rear aspect, laminate flooring and stairs leading from first floor. Double glazed uPVC window to front aspect, radiator, laminate flooring and painted plaster ceiling with spotlights. Double glazed uPVC window with frosted glass to side aspect, heated towel rail, laminate flooring, part tiled walls, painted plaster ceiling with spotlights, low level WC, single shower cubicle with thermostatic shower, vanity unit with wash hand basin and extractor fan. Double glazed wood velux window to rear aspect, double glazed uPVC window to side aspect, radiator and painted plaster ceiling with ceiling light.